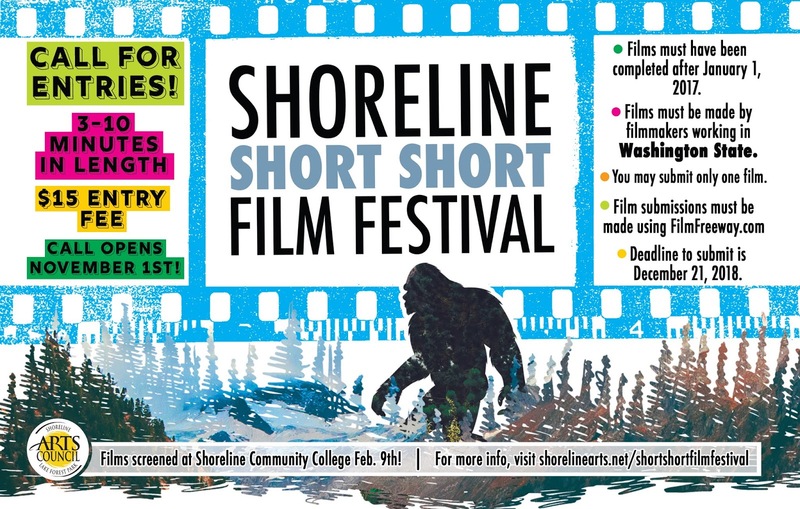 Due to the prediction of inclement weather hitting our area this Friday and Saturday, we have decided to postpone the Shoreline Short Short Film Festival. Bummer! But do not fret, we have a shiny new date scheduled. Please join us on Saturday, April 6, 2019, for Washington made short films! Everything shall remain the same other than a simple date change! If you have already purchased a ticket we look forward to seeing you on April 6. If you cannot make it that day, you can get a refund from the online ticketing services. If you have a physical ticket with the original date printed on it, we will gladly accept it! If you have any questions feel free to contact us at publicity@shorelinearts.net or give us a call at 206-417-4645. We appreciate your flexibility and understanding! Lights, Camera, Action! 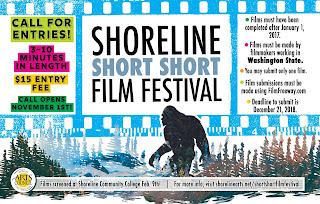 The Shoreline Short Short Film Festival is coming back for its third year! Filmmakers from all over Washington have submitted their “short short” films and you’re invited to see the selected films on Saturday, April 6 at 7pm in the state-of-the-art Shoreline Community College Theater. Doors open at 6pm, and the movies start at 7pm. The evening will showcase a juried selection of 3-10 minute films made by emerging and developing filmmakers working in our community. The top filmmakers will be honored with impressive handmade Golden Sasquatch statues and cash prizes, and you can vote for your favorite filmmaker to win the People’s Choice Award! All films are unrated and a select few contain adult/mature content. We Shall Not Be Moved by Tae Phoenix, Lara Lavi Jones, Wayne Rutledge, and Maurice Jones Jr.
Tickets are $20, parking is free, and popcorn, candy, soda, wine, and beer will be available for purchase. Don’t miss your opportunity to support up-and-coming filmmakers during this fun, community event! Reserve your tickets today or you can buy them at the door. And if you are a member or become a member of the Shoreline-Lake Forest Park Arts Council, you get two free tickets to the Film Festival. This event is presented with support from Shoreline Community College, the City of Shoreline, the City of Lake Forest Park, 4Culture, and individual donations from people like you.